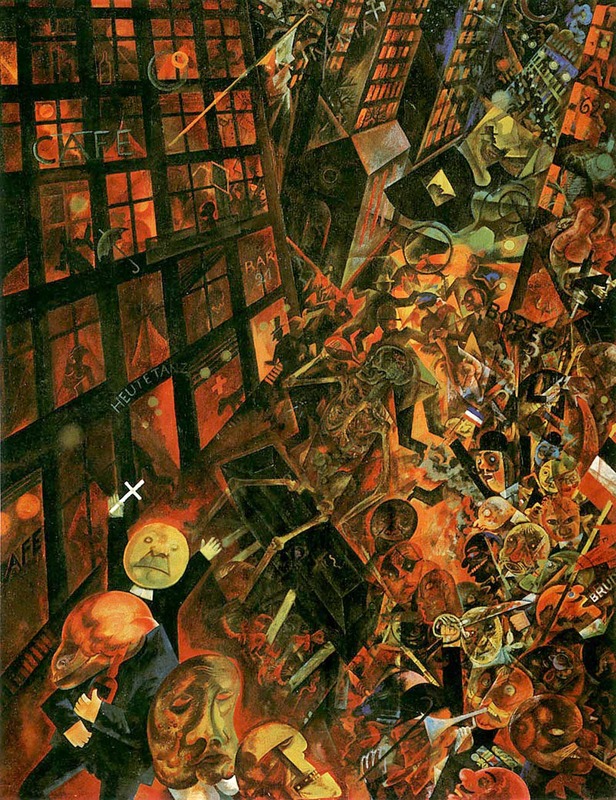 I have been thinking about the work of the German painter George Grosz, who was born in 1893 and died in 1959. Maybe it’s the tone of these recent days in this country, darkly ominous and tinged with potential violence, that bring his work to mind. 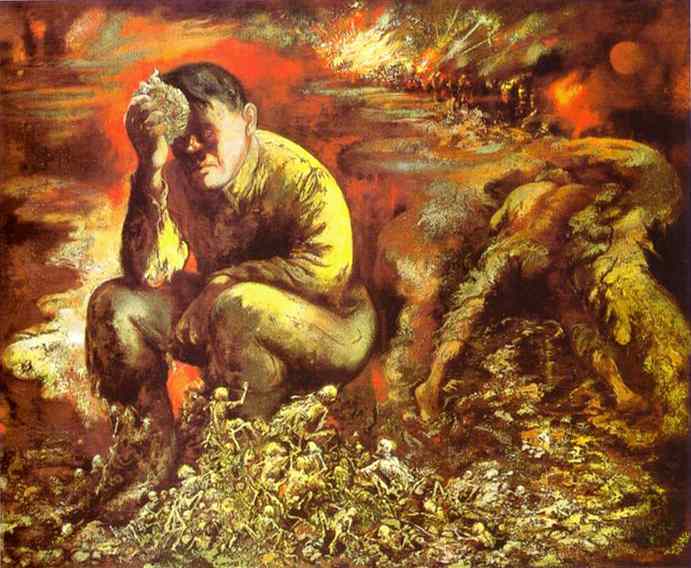 His work definitely dealt with the tenor of his time, mirroring the mood of the two world wars and the rise of fascism in Europe and Hitler in Nazi Germany to which he was a witness. I thought I would replay an earlier blog post about Grosz that ran six years back. I’ve added a few more examples of his work as well as a video slideshow. The music in it is Andre Rieu playing a selection from The Merry Widow which adds a slightly lighter touch to the film. I woke up in the dark this morning after a fitful night of sleep filled with horrible dreams. I don’t want to go into the details but they were awful and constant, each sweeping from desperate scene into yet another. Dark and tinged in deep colors of black and red. Hopeless in the scope of their finality and, though I am hesitant to use the word, there was a sense of apocalypse. I was shaken. I’ve had many horrifying dreams over the years but they seldom felt so vast and desperately final. As I trudged down to pick up my newspaper I tried to sort out the dream and try to find an equivalence in imagery that I know that captured in some way the feel of these dreams. 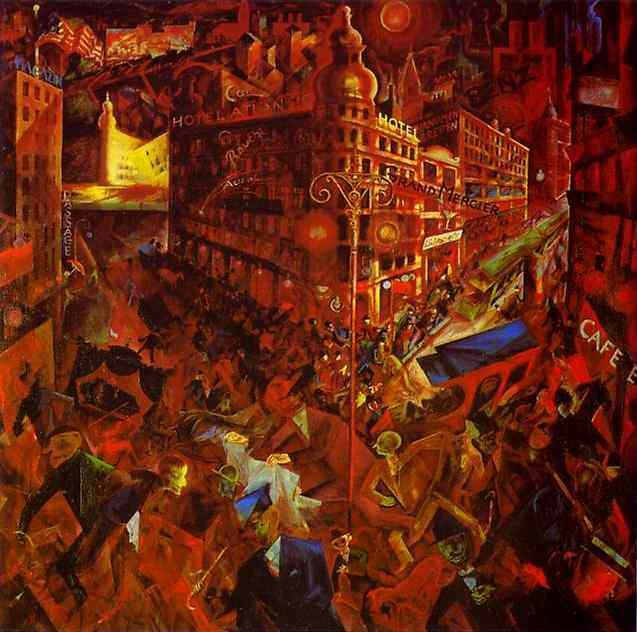 As I neared the studio the dark paintings of George Grosz done in Germany in the years before World War I came to mind. They were forebodingly dark and angry and just the overall look of them made me think of the darkest corners of man’s mind. The red tones and the way they filled the picture plane along with the chaotic nature of the compositions brought to mind the nightmarish feel of my dreams. 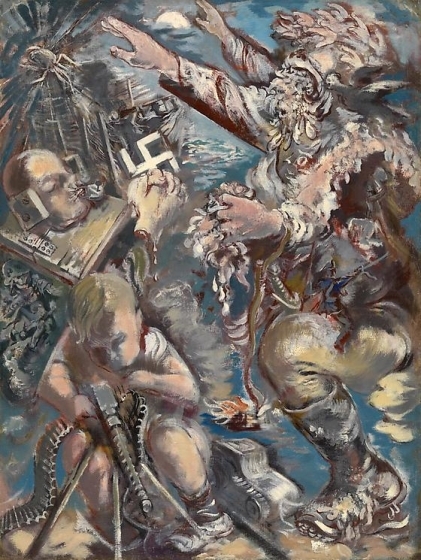 Grosz’s work changed over the years, especially after fleeing Hitler’s Germany, moving to the New York in the 1930’s where he lived until the late 1950’s when he returned to Berlin, dying there in 1959. His American work is often considered the wekest of his career, less biting and more esoteric. 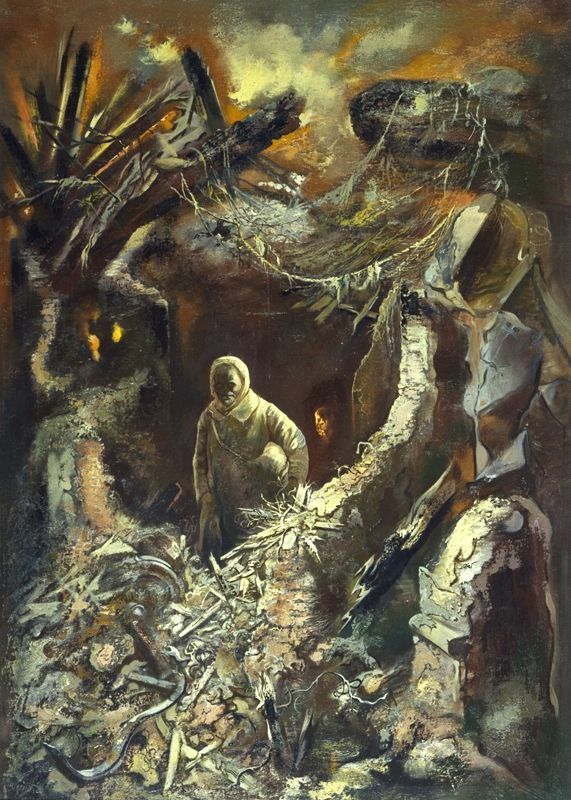 There were exceptions during the war such as 1944’s Cain, Or Hitler in Hell, shown here, which reverts back to the colors and nightmare feel of his early work. 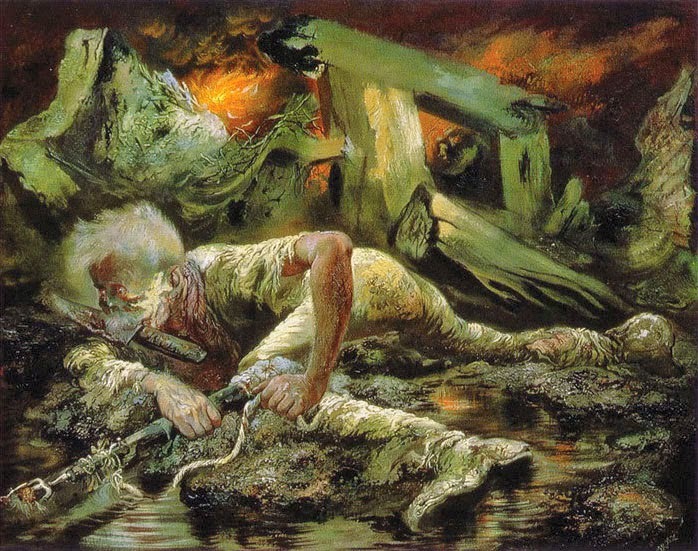 Very powerful work that may not sooth one’s soul but rather documents the darker aspects of human existence. I don’t know if my own nightmares have an effect on my work. Perhaps they come out in work that seems the antithesis of them, work that seeks to calm and assure. I don’t really know to be honest. I know that I want to put last night’s visions behind me. 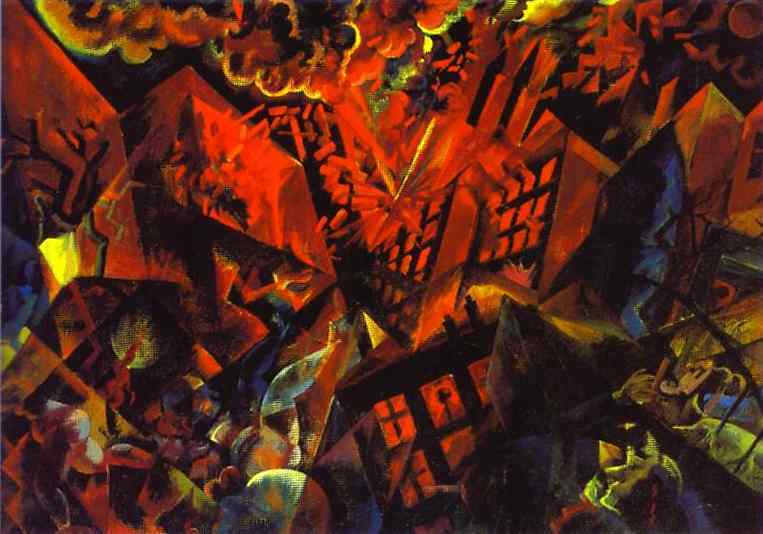 To that end, I think I should get to work and let my nightmares only dwell in the work of Grosz for now. I have written a number of times here about the events that are taking place in this country and my frustration at how little effect reasoning and factual evidence have on the followers of the current president. Their stubborn stupidity seems impenetrable to even the most glaring truths. I am sure that there are many of them out there who still, faced with an ever expanding list of acts of malfeasance, refuse to see anything other than a conspiracy against the leader of their cult. It turns out that this phenomenon is nothing new. It can probably found in every major movement based on political power or religion. One of the most enlightening essays on the subject of the stupidity of the follower came to us in a letter written in a German prison during World War II by theologian and anti-Nazi dissident Dietrich Boenhoeffer. The first paragraph of the essay is shown above. Dietrich Boenhoeffer was a pastor and theological writer who stood in direct opposition to the Nazi regime and spoke out against its programs of euthanasia and genocide. He had an opportunity to stay in the US in the late 1930’s, safe from the reach of the Nazis, but he insisted on returning, believing that if he were to rebuild the German church in the war’s aftermath he must endure it with its people. He was imprisoned in a German prison in 1943 and later transferred to a concentration camp. He was implicated in a plot to assassinate Hitler and he was hanged in the waning days of the war, in April of 1945. Dietrich Boenhoeffer’s story is most interesting and his writings live on and have great influence to this day. One of the terms he coined was cheap grace which also has great meaning today. I’ve included an apt description of this at the bottom of this page.. The following essay is taken from a letter written while in captivity. I urge you to read it. It may help you understand better your own frustration wit what you see today. And if you are one of those who fail to see what seems so clearly evident to most people, perhaps you should read it then ask yourself how you allowed yourself to be swept up in this grand wave of stupidity. ‘Stupidity is a more dangerous enemy of the good than malice. One may protest against evil; it can be exposed and, if need be, prevented by use of force. Evil always carries within itself the germ of its own subversion in that it leaves behind in human beings at least a sense of unease. Against stupidity we are defenseless. Neither protests nor the use of force accomplish anything here; reasons fall on deaf ears; facts that contradict one’s prejudgment simply need not be believed- in such moments the stupid person even becomes critical – and when facts are irrefutable they are just pushed aside as inconsequential, as incidental. In all this the stupid person, in contrast to the malicious one, is utterly self-satisfied and, being easily irritated, becomes dangerous by going on the attack. For that reason, greater caution is called for than with a malicious one. Never again will we try to persuade the stupid person with reasons, for it is senseless and dangerous. ‘If we want to know how to get the better of stupidity, we must seek to understand its nature. This much is certain, that it is in essence not an intellectual defect but a human one. There are human beings who are of remarkably agile intellect yet stupid, and others who are intellectually quite dull yet anything but stupid. We discover this to our surprise in particular situations. The impression one gains is not so much that stupidity is a congenital defect, but that, under certain circumstances, people are made stupid or that they allow this to happen to them. We note further that people who have isolated themselves from others or who lives in solitude manifest this defect less frequently than individuals or groups of people inclined or condemned to sociability. And so it would seem that stupidity is perhaps less a psychological than a sociological problem. It is a particular form of the impact of historical circumstances on human beings, a psychological concomitant of certain external conditions. Upon closer observation, it becomes apparent that every strong upsurge of power in the public sphere, be it of a political or of a religious nature, infects a large part of humankind with stupidity. It would even seem that this is virtually a sociological-psychological law. The power of the one needs the stupidity of the other.The process at work here is not that particular human capacities, for instance, the intellect, suddenly atrophy or fail. Instead, it seems that under the overwhelming impact of rising power, humans are deprived of their inner independence, and, more or less consciously, give up establishing an autonomous position toward the emerging circumstances. The fact that the stupid person is often stubborn must not blind us to the fact that he is not independent. In conversation with him, one virtually feels that one is dealing not at all with a person, but with slogans, catchwords and the like that have taken possession of him. He is under a spell, blinded, misused, and abused in his very being. Having thus become a mindless tool, the stupid person will also be capable of any evil and at the same time incapable of seeing that it is evil. This is where the danger of diabolical misuse lurks, for it is this that can once and for all destroy human beings. ‘Yet at this very point it becomes quite clear that only an act of liberation, not instruction, can overcome stupidity. Here we must come to terms with the fact that in must cases a genuine internal liberation becomes possible only when external liberation has preceded it. Until then we must abandon all attempts to convince the stupid person. This state of affairs explains why in such circumstances our attempts to know what ‘the people’ really thing are in vain and why, under these circumstances, this question is so irrelevant for the person who is thinking and acting responsibly. The word of the Bible that the fear of God is the beginning of wisdom declares that the internal liberation of human beings to live the responsible life before God is the only genuine way to overcome stupidity. A friend of mine posted the quote below, one that I have long admired, online this morning and it set me off thinking how our indifference to so many things affects us in many ways. For example, in the blogpost below from a couple of years back I wrote of how I was spurred on by the unknowing indifference of others to my work. But we are also sometimes intellectually lax and this allows us to build up an indifference to things that we know in our cores are wrong and unacceptable. Take for example the words and actions of Donald Trump. He often says and does things that deserve loud condemnation yet we have come to have an indifference, a tolerance, to his constant stream of untruth and divisive rhetoric. It seems easier to accept something that should appall us, especially when his supporters are so loud and angry, than to step up and say that this is wrong. So we let his many and well documented lies, his unfounded boasts and his vitriolic appeals to our darker angels slide. In our indifference we don’t look any further into his words or past. We begin to accept him at face value. This sort of indifference is always a dangerous thing. Elie Wiesel knew that from firsthand experience in the Germany of the 1930’s when Hitler’s appeal to nationalism and the indifference of those who saw him as a fool and not a threat allowed the rise of Nazism which led to Auschwitz and to the many other horrors of WW II. Don’t go crazy here– I am not making that jump in saying that Trump will lead us to anything like Nazi Germany. But to let disinterest and indifference creep into how we view our civic responsibility in voting is a dangerous thing. Our indifference may have us thinking that this election doesn’t have much to do with our day to day life. But ask the vets who fight our wars or the families who are left to bury them. The point here is to fight indifference, to stop and be curious when faced with anything. The world is too complicated for us to be careless and indifferent. Especially now. I’ve been sitting here for quite some time now, staring at the quote above from Nobel Prize winner Elie Wiesel. I had planned on writing about how my work evolved as a response to the indifference of others but now, looking at those words and putting them into the context of Wiesel’s experience, I feel a bit foolish. Wiesel, who had survived the Holocaust, was eyewitness to indifference on a grand scale, from those who were complicit or those who did not raise their voices in protest even though they knew what was happening to the personal indifference shown by his Nazi guards, as they turned a blind eye to the suffering and inhumanity directly before them on a daily basis, treating them as though they were nothing at all.